One of my favorite photo effects is editing an image to give it the look of a black and white image with just a hint of color. There are probably hundreds of different ways that you can accomplish this, but one of the easiest is by blending layers using an image editor. The original of the photo above had quite a bit of black and white in the scene already, so the results were a bit more dramatic. It is really a matter of playing in your editor until you like what you see but this tutorial should help point you in the right direction. Although this tutorial was written for Corel Paint Shop Pro Photo X2, you will find that this process is very similar in many image editors, including previous versions of Paint Shop Pro. Start by making a copy of the original full color photo. To do this, simply right click on the image and select, Copy. Then right click again, and select, Paste > Paste as New Image. You should now have two identical color photos. The next stage is to convert one of the color photographs to black and white. The number of ways that you can do this are almost unlimited. You may want to download Virtual Photographer Plugin Filter Effects if you prefer dramatic black and white photo effects. 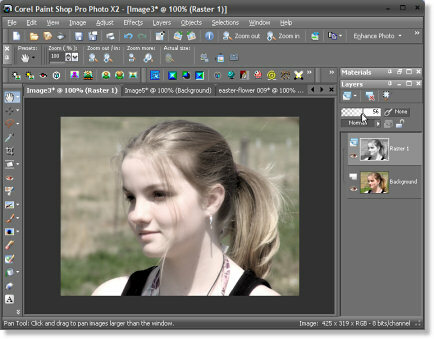 However, with Paint Shop Pro Photo X2 you will find multiple options already available by default within the program. You can then either choose the Suggest Color option, or you can experiment until you are happy with the results. 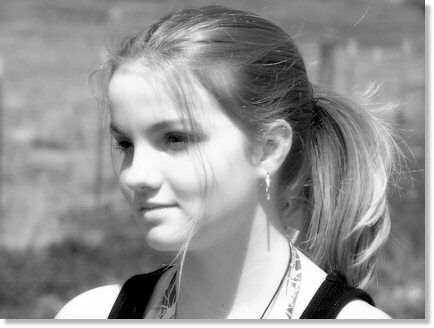 Make a copy of the black and white image, by once again right clicking and selecting, Copy. Now, click on the tab for the color image and select, Paste > Paste as New Layer. You should now see both the color and the black and white image in your layer palette on the right side of the program. If you do not see it, as shown in the screenshot below, you may need to enable it by selecting, View > Palettes > Layers, or by selecting F8 on your keyboard, as a shortcut. Click on the black and white thumbnail in the layers palette on your right, to make sure you are working from the raster layer. Near the top of the layers palette you will see a number that is probably set at 100, with a small triangle arrow below it. Slide that arrow to the left by left clicking on it (keep holding it down) and dragging the arrow to the left until you are happy with the results. The smaller the number you choose, the more color you will see. For this particular photograph, I left in quite a bit of color, while still softening the results to my liking. Once you are satisfied with the results, merge the two layers by selecting, Layers > Merge > Merge All (Flatten). You are now ready to resize and optimize the photo for web use. Thanks for this tutorial Cricket! I’d recently seen one for Photoshop but wasn’t sure how to do it with PSPx2. I can’t wait to try it now!